Philip Morris International – the giant cigarette manufacturer – announced in September 2017 that it had established the Foundation for a Smoke-Free World, with funding of $80 million per year over the next 12 years. This foundation is part of the company’s campaign to portray itself as part of the solution to the global tobacco epidemic, which kills more than 7 million people worldwide each year. 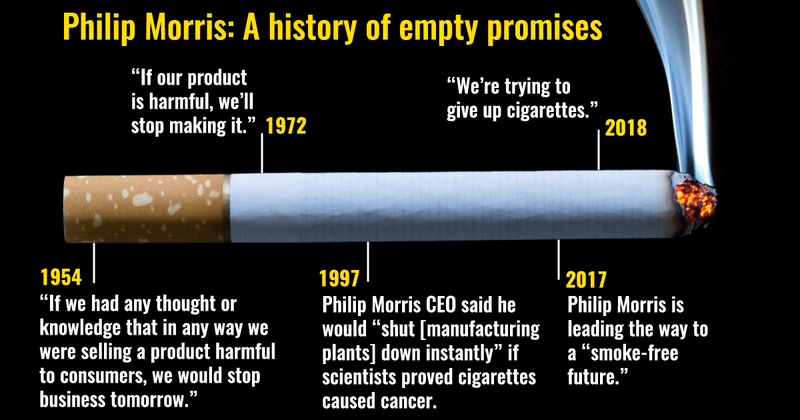 In fact, far from being part of the solution, Philip Morris is a primary cause of this enormous public health problem and the primary obstacle to greater progress. Philip Morris spends billions to market cigarettes around the world, often in ways that appeal to kids and often targeting vulnerable low- and middle-income countries. It also works across the globe to defeat and undermine policies proven to reduce smoking and other tobacco use. The new foundation follows the same strategy Philip Morris and other tobacco companies have used for over 60 years to fight efforts to reduce smoking. Tobacco companies have a long history of funding supposedly “independent” research that was intended to discredit real scientific evidence, mislead the public and divert attention from real solutions and the companies’ own harmful actions. Public health leaders and institutions around the world have seen through Philip Morris’ smokescreen and called on their peers not to work with the foundation. Set an example for the tobacco industry by stopping all marketing of cigarettes.